Hello sweet TT&J friends! I’m Angie from Echoes of Laughter and I am absolutely OVER-THE-MOON-DELIGHTED to be visiting here today! I have been following TT&J since forever and I totally want to move into the 1905 Cottage and cook-up a storm in that fabulous kitchen that Jen designed! Even though we got a sprinkling of snow in my northern city today, I am happily staying warm inside and creating Easter projects in the pastels and ice creams colors that I adore indulging in for Spring loveliness. I am so excited to share these easy & cute Easter Mocktails with you. They can be a wonderful, festive touch to a party or Easter dinner, as well as a cute after school snack or even a project for kids to make for themselves! And these mocktails are full of goodness… 100% juice and fruit, so not only are they bunny-licious, but gluten-free, nut-free and dairy-free too! And what do bunnies drink? Carrot juice of course! To create this project, a few supplies will need to be gathered up to get started. 1. Using bunny cookie cutter, cut out bunny shapes in watermelon. 2. Cut skewers to a length that fit the milk bottles if they are too long. 3.Assemble bunny stir sticks with fruit. Add cherry, piece of kiwi and bunny head last. 4. To decorate milk bottles, wrap some colored baking twine around the neck, and add a felt cutout such as a daisy. 5. Pop a fruit stir stick and straw into each milk bottle. 6. Decorate the Carafe with a doily, baker’s twine and a bunny cutout as shown for a big touch of cuteness. 7. At serving time, pour chilled juice into carafe, and serve each guest a cute bunny mocktail in their own cute milk bottle. Bunny Mocktails would also make a great gift too! You could throw some chilled juice into a basket with the bunny fruit sticks, straws and cups for a special Bunny Mocktail kit for Easter! I love entertaining and sharing food with friends. I often find that taking the simplest things, like juice and fruit, and packaging them in a creative way, can add some awesome fun to any gathering! Thank you so much for spending some time with me today! 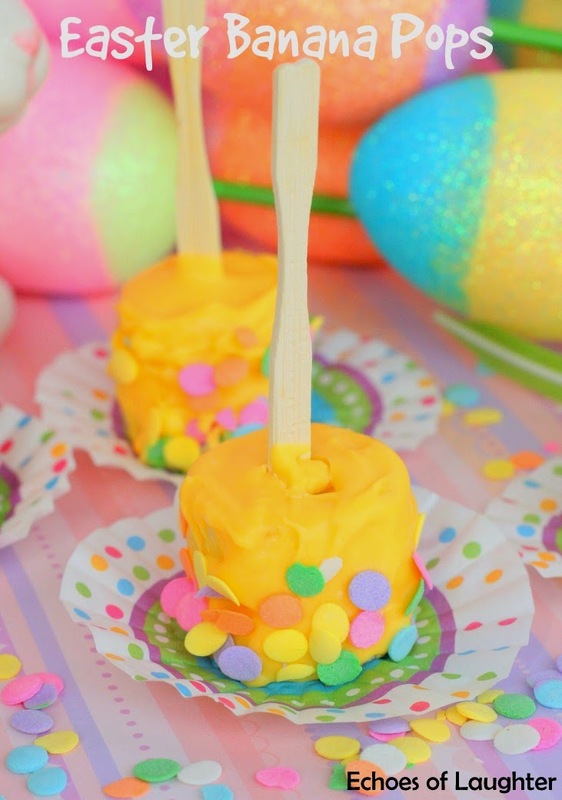 Her Easter Banana Pops look like such a fun treat for the kids to help make too! 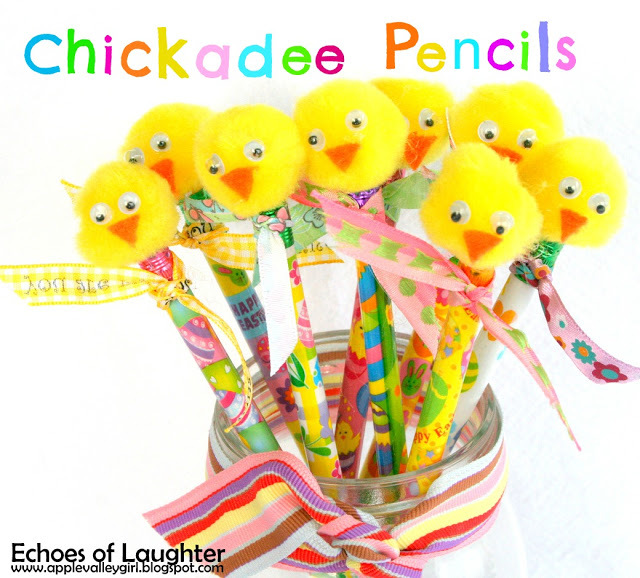 These Chickadee Pencils would be the perfect inexpensive gift for kids to hand out to their friends! 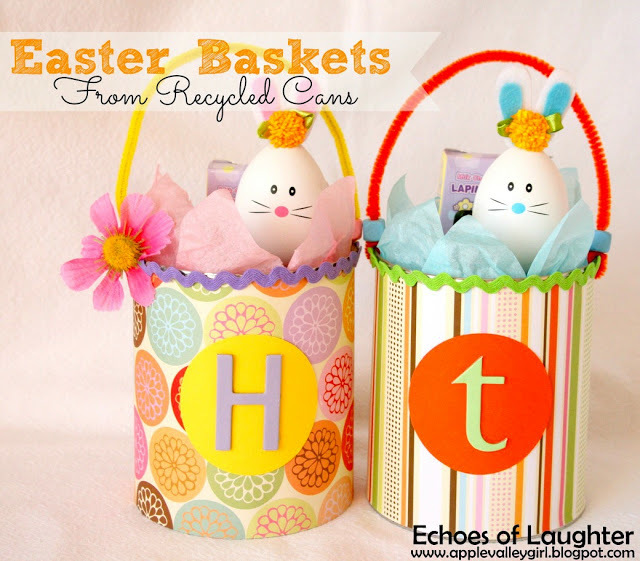 And, these Easter Baskets from Recycled Cans are a perfect idea to re-purpose something you already have! Chalkboard Place Cards with DIY Wire Easter Eggs!! Make Gold and Glitter Marbled Easter Eggs!! Link Party Palooza — and Daybreak Utah’s Lululemon Giveaway! Another fabulous creation Angie! This looks like so much fun for the kiddies! These are adorable Angie!! My boys would love them… the little cut out watermelon bunnies are too cute for words!! I know what im doing for Easter! Thanks for the Cool Idea. I’m thinking Rum soaked watermelon rabbits i’ll call them wathermellion hellions! Really cool! you are very talented! Angie, love all of your ideas. You are so creative. The Mocktails look so refreshing! Love this idea. So simple yet amazing! As always – you are incredibly creative – thanks for sharing Angie!! Those are so adorable! Angie always has the most adorable ideas. I love that it’s a treat that even my son with food allergies can enjoy! Those are absolutely adorable, Angie!! What a terrific idea. Love all the colours…so springy (a sight for sore winter eyes!). Also love the great idea of using the cookie cutter bunny head to cut out the watermelon. Love your ideas…awesome as always!